Drop-In Templates were developed to make "coolifying" your site very easy. While they sacrifice the instant customization of the Color Configurator, they make up for that lack in coolness, by instantly deploying a site that's graphically appealing. Historically, customizing your site like that required doing custom programming with the Advanced Layout Options, but that is something normally reserved for the more technically inclined. That is the problem solved by the Drop-In Templates. Beyond that, you are able to edit and modify those layouts rather easily by utilizing the Advanced Layout Options further, so the Drop-In Templates provide an instant basis for more advanced customization. In this document, though, we'll just talk about deploying a Drop-In Template. It's very, very easy. Head to your Admin menu. 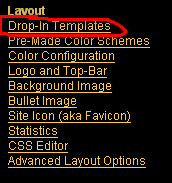 This will bring you to a page which lists all of the currently available Drop-In Templates. Drop-In Templates were developed to make "coolifying" your site very easy. While they sacrifice the instant customization of the [guide=ColorConfigurator]Color Configurator[/guide], they make up for that lack in coolness, by instantly deploying a site that's graphically appealing. Historically, customizing your site like that required doing custom programming with the [guide=AdvancedLayoutOptions]Advanced Layout Options[/guide], but that is something normally reserved for the more technically inclined. That is the problem solved by the Drop-In Templates. Beyond that, you are able to edit and modify those layouts rather easily by utilizing the Advanced Layout Options further, so the Drop-In Templates provide an instant basis for more advanced customization. In this document, though, we'll just talk about deploying a Drop-In Template. It's very, very easy. Head to your Admin menu. 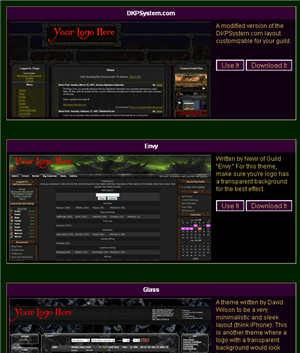 [img]faq/adminmenu.png[/img] Click Drop-In Templates [img]faq/dropintemplates.png[/img] This will bring you to a page which lists all of the currently available Drop-In Templates. [img]faq/dropintemplatepage.png[/img] Next to each preview image are two buttons: [ul] [li]Use It: This will deploy the template on your site[/li] [li]Download It: This will download a zip file of all the files used. This makes customization with the Advanced Layout options easier[/li][/ul] That's it!